A weekly newsletter to keep you informed about EVERYTHING Turf at the Maryland SoccerPlex. T oday we will look at 3 common spring time lawn diseases that homeowners should be aware of. The birds are migrating home, and we all know what that means...spring is almost here! The spring is the biggest time of year for consumers to get excited about their lawns. Sales for seed, and lawncare products increases exponentially at the beginning of spring! We wanted to help you be aware of some common diseases that may affect your lawn, and how to prevent them so you don't have to deal with them! can be seen with the naked eye on the infected leaves. Maintain adequate soil fertility, this can be determined through a soil test. Keep mower blades sharp to minimize wounding the blade, which increases chance of infection. Collect grass clippings when disease is active to reduce the infecting coming in contact with fresh cut blades. What if I get red thread and pink patch? Don't worry! It's very treatable. When treating red thread and pink patch your goal is to disrupt the disease cycle so the fungus stops growing. The best way to manage the lawn disease is to strengthen the grass with fertilizer with nitrogen. It is advised to apply 0.2 pounds of nitrogen per 1,000 square feet of lawn. It may take two to three years of an established, fertilized lawn to prevent red thread and pink patch from coming back each year. wilt and turn brown but stay upright. The steps for treating brown patch are the same as how to prevent it, check them out! When fertilizing, avoid heavy early spring and summer fertilization. And avoid over-fertilizing in shaded areas. Water to a depth of about 6 inches one a week, any more provides the ideal environment for diseases. 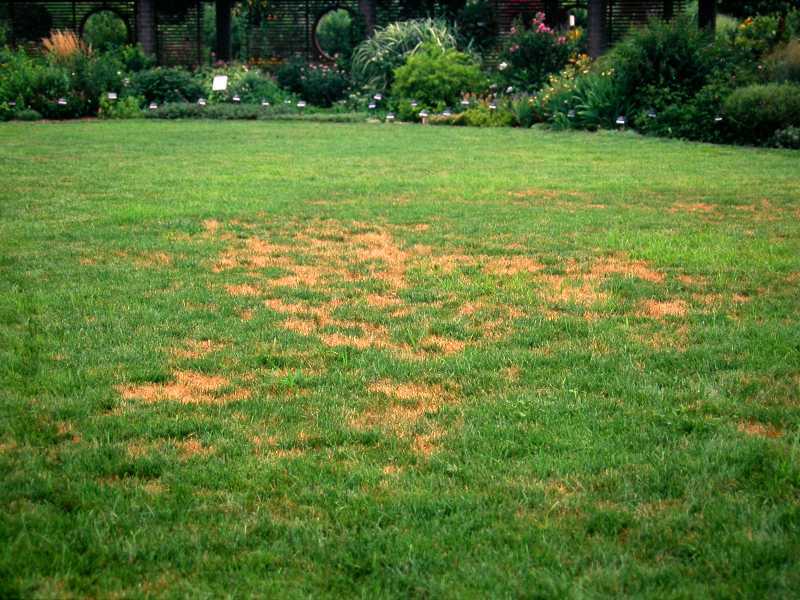 Dollar spot is a fungus that appears as light tan circular spots across the lawn. It commonly looks like the size of a silver dollar, which is where it got its name from. As dollar spot continues to grow it can merge together and form into larger brown patches. Often times the blades of grass affected appear as a hay-like texture instead of the usual grass blade. Dollar spot thrives when the soil is dry, but the air is wet. The worst of dollar spot is usually when the humidity is high and the rainfall is low. Water your lawn deeply, but infrequently. Much like the advice of avoiding brown patch, being sure to water in the morning and watering to simulate a heavy rainfall is ideal. But be sure to not overwater, the once a week schedule will be perfect. When mowing your lawn be sure to mow with a sharp blade to cut and not just tear it and clean your clippings as you mow. Fertilizing in late spring will give your lawn the extra boost before the summer drought season normally occurs which is when dollar spot begins popping up. If you do see dollar spot, be sure you are watering the proper amount, not too long to saturate everything, just enough to simulate a heavy rainfall and penetrate in the roots of the grass. Also when watering be sure to allow ample time for the blades of the grass to dry out before the evening. Follow these tips and your lawn will be looking great in no time! Next week we will discuss changes in the fields that were made over the winter! Do you have a burning turfgrass related question? Ask us! We will be happy to answer it in future iterations of Turf Talk - just email us at info@mdsoccerplex.org, subject line Turf Talk Question. Their Continued Support of the Maryland SoccerPlex. Learn more about Fine Earth here.